One would think that if two conferences take place in the very same building at the very same time, there would be some connection between the discussions and outcomes. Alas, in the big bureaucratic jungle of the UN Headquarters in New York this is usually not the case. In April, for example, a colorful meeting of the UN Permanent Forum on Indigenous Issues (UNPFII) with hundreds of Indigenous representatives was held literally down the corridor from a meeting to elaborate the post-2015 development agenda. The UNPFII recommended amongst others that the action points on data disaggregation, land rights, traditional knowledge, the implementation of free, prior and informed consent, access to justice and traditional knowledge agreed upon in the outcome document of the World Conference on Indigenous Peoples should be integrated in the post-2015 development agenda. It further recommended that Indigenous Peoples be engaged in the Expert Group in developing key indicators to monitor implementation of the proposed agenda. But sadly these recommendations were almost squarely ignored in the post-2015 process. Despite its central message “Leave No One Behind”, Indigenous Peoples remain almost invisible in the goals and targets. Only one of the proposed indicators recognizes the roles that Indigenous Peoples and local communities and their conservation initiatives can play in the implementation of the Sustainable Development Goals (SDGs), and this indicator is under threat as being considered ‘unfeasible’. A veces esperas lo peor y no quedas decepcionado. Cuando el Programa de Inversión Forestal del Banco Mundial (FIP) fue establecido hace 6 años, la Coalición Mundial por los Bosques estábamos escépticos por decir lo menos. El Banco Mundial había financiado (y continúa financiando) numerosos proyectos con un impacto devastador sobre los bosques y las personas dependientes de los bosques, Ponerlos a cargo de lo que es hasta ahora el fondo mundial más grande en cuanto a inversión en proyectos para reducción de emisiones por deforestación y degradación de bosques y fortalecimiento de reservas de carbono (REDD+), sonaba como un caso clásico caso en donde se invita a los lobos al rebaño. Sometimes you expect the worst, and you are not disappointed. When the World Bank Forest Investment Program (FIP) was established 6 years ago, we were skeptic to say the least, as Global Forest Coalition. The World Bank had funded (and continues to fund) numerous projects with a devastating impact on forests and forest dependent peoples. Putting them in charge of what is until now the largest global fund to invest in projects to reduce emissions from deforestation and forest degradation and enhance forest carbon stocks (REDD+) sounded like a classical case of inviting the wolves to herd the sheep. Jindal coal mining affected villagers revolt! In Bougainville, Papua New Guinea, the catastrophic environmental damage and social upheaval caused by the Panguna copper mine sparked a decade-long civil war that claimed thousands of lives, unleashed waves of gender-based violence, and tore apart the social fabric of the island. Talks are now underway to re-open that mine. In Bangladesh, two years after 1100 people were killed by the collapse of Rana Plaza, garment workers continue to experience violence and intimidation for attempting to form unions and claim their right to decent work. Survivors and families of victims are still waiting for financial contributions from European and American companies that sourced their clothes from Rana Plaza to cover their medical expenses and mitigate the loss of their livelihoods. In the Philippines, the government continues to deploy military and paramilitary units long associated with human rights violations as part of an Investment Defence Force that ‘secures’ large-scale development projects—usually against resistance by indigenous peoples whose rights are routinely ignored. And across south-east Asia, foreign investors are free to avail themselves of Investor-State Dispute Settlement clauses when governments take measures in the public interest that are perceived to reduce their profits. Given the impunity with which corporations in Asia and the Pacific operate, the adoption by the UN Human Rights Council of a Resolution last year to elaborate a binding instrument “to regulate, in international human rights law, the activities of transnational corporations and other business enterprises” provides a critical opportunity to advance corporate accountability. 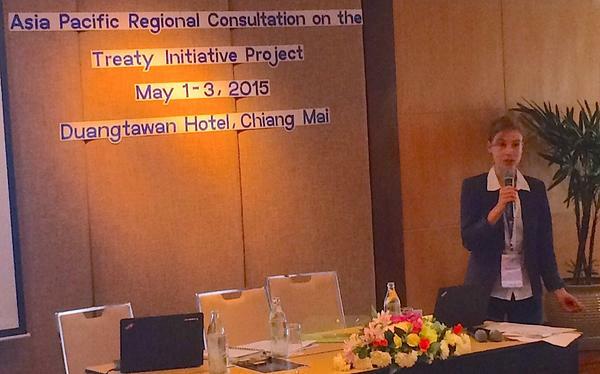 From 1-3 May, civil society gathered in Chiang Mai, Thailand, to discuss how to ensure that the process of developing a treaty responds to the needs of communities that experience human rights violations caused by businesses. The Consultation, which was co-convened by ESCR-Net, FIDH and the Asia Pacific Forum on Women, Law and Development, brought together affected communities from the region with an expert legal group who will work collectively to develop proposals on how best to address gaps in corporate accountability. It is the first of three Regional Consultations with civil society to be convened over the next year as the Intergovernmental Working Group established under the Resolution begins its work of defining the content and form of the treaty. Civil society participants in Chiang Mai discussed the nature of human rights violations they have experienced as a result of corporate activity, the challenges they face in seeking a remedy, as well as the remedies and mechanisms that would be necessary to protect and fulfil their human rights. The legal group considered how these might shape proposals for State and corporate obligations under the treaty, including different theories of civil and criminal liability, as well as for effective means of redress at local, national and international levels. The Consultation also yielded strategies for networks and social movements in the region to use the treaty process to strengthen their own work around corporate accountability. Civil society participants are now working towards developing a unity statement setting out their key demands for the treaty. Among the issues highlighted was that no government in the Human Rights Council voted consistently last year to protect women’s human rights. While voting in favour of the TNC Resolution is consistent with protecting women’s rights—a recent report observed that most of the victims of violations by TNCs are women—the governments that voted in favour of that Resolution also voted in favour of a regressive Resolution on the protection of the family. As the private sector’s anticipated role in financing and implementing the next development agenda continues to expand, the process of elaborating a new framework is an opportunity for civil society to challenge the narrative that assumes that corporate actors can be trusted—in the absence of binding regulation—to act in alignment with the objectives of equitable, sustainable development and human rights. The Intergovernmental Working Group established under the Resolution will meet for the first time in Geneva in July, beginning the next phase in this critical new process. For more information about this process, visit the treaty initiative website. For more on APWLD’s work on extraterritorial obligations, visit our website.